If you own a home with hardwood floors at some point in time, the surface is bound to be scratched. 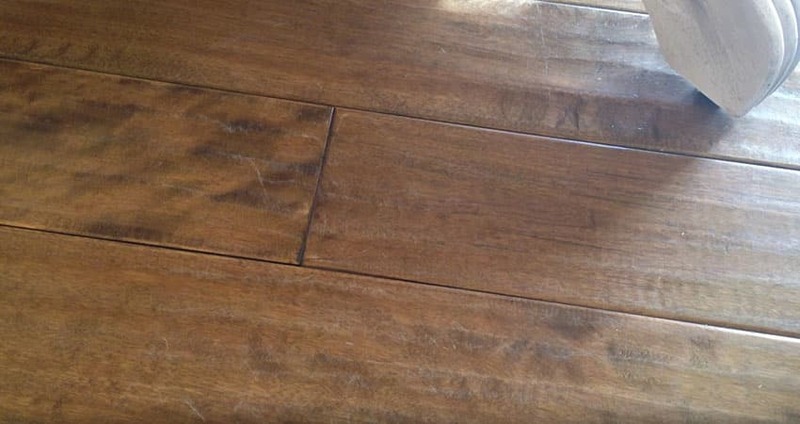 There are several ways to fix a scratched wood floor. The methods are wiping the scratch away, concealing it with a wood stain marker, sanding and filing the area with wood wax, or sanding and sealing with wood filler. Below are the best ways to fix a scratched wood floor and get it back to looking as good as new. 1. Wiping the scratched area – use a soft rag that is damped with water and then gently clean the hardwood floor’s surface to remove any excess debris or dirt. 2. Dampening a rag using a wood stain marker – a wood stain marker matching the color of the hardwood floor is used then you will have to fold a clean rag or a paper towel in squares so that the material will have a few layers. Next, shake the stain marker prior to opening it and then dab the marker’s point into the corner of the cloth. Dab the marker about 10-15 times so that the cloth can be dampened effectively with the wood stain. 3. Rubbing the stain into the scratch – lightly press the cloth onto the wood while having focus on the scratched area then rub the wood stain into the scratch while making certain that you follow the grain of the wood. 1. Cleaning the scratched area – a soft rag like a microfiber with a small amount of hardwood floor cleaner is used in removing the contaminants from the scratched area. 2. Rinsing off the cleaner – dampen another rag with water after you clean the scratched area on the floor then wipe down the scratched area for removing the cleanser. Let it dry. 3. Applying a top coating – a small tipped brush is used in applying a thin layer of protective finish to the scratched area. This can be in the form of sealant, shellac, or polyurethane varnish. 1. Cleaning the scratched area – a soft rag with small amount of hardwood floor cleaner is used in cleaning the floor’s scratched area to remove the small dirt or dust particles. 2. Rinsing the scratched area – you will be wiping down the scratched area using a damp rag that is moistened with water to remove the cleanser as well as sanitize the workspace. 3. Sanding the scratch – do a gentle rub over the scratch using a fine steel wool while making sure to rub following the wood’s grain. Lightly sand away the scratch up to the time that it blends with the surrounding wood then lightly sand the edges of the scratch for uniformity. 4. Filling in the scratch – rub a wax stick onto the scratched and sanded area for filling in the scratch. Let the wood wax dry and harden for a minimum of ten minutes. 5. Buffing the scratch – a clean, soft cloth is used to rub back and forth and to buff the wax to make the scratched area smooth. 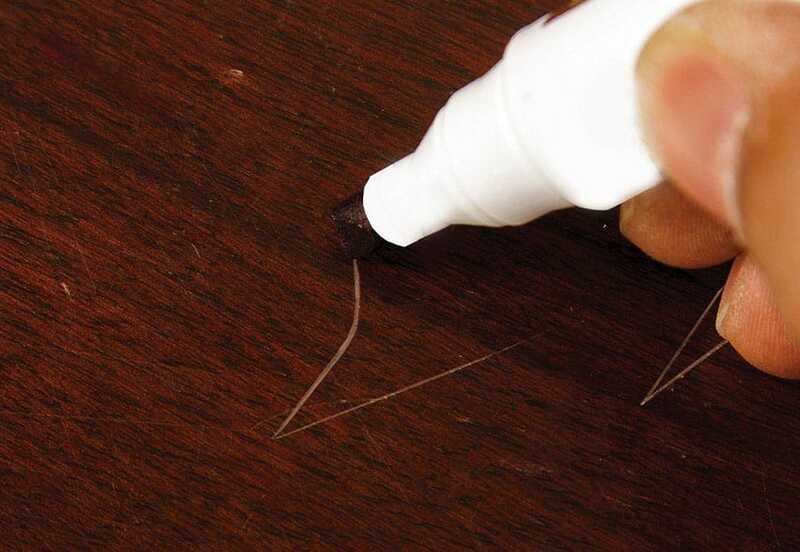 Above is an example of fixing a furniture scratch with a combination of a felt tip marker and wax sticks. 1. Cleaning the scratched area – use a soft rag dampened with small amount of hardwood floor cleaner. 2. Rinsing away the hardwood cleaner – a new rag dampened with water is used to wipe down the scratched area. 3. Rubbing mineral spirits over the scratch – polyurethane layer, if present, need to be removed prior to fixing the scratch. A scouring pad is dampened with mineral spirits then gently rubbed to the scratched area then followed with wiping using a clean cloth. 4. Filling in the scratch – a small amount of wood filler is applied to the pointer finer and let the finger work the wood filler into the scratch or gouge. Spread the filler in all directions so that air bubbles can be removed. 5. Wiping off excess filling – a putty knife is dragged over the wood filler to smooth the surface. 6. Sanding excess filling – a small pad of fine girt of sandpaper is used to sand the area surrounding the scratch where the excessive wood filler was spread. 7. Wiping away excessive filling – use a damp cloth to wring it out. The finger can be used to have precised wiping away of the excess filler. 8. Sealing the patched area – a thin layer of sealer is used and let is dry for about 24 hours. 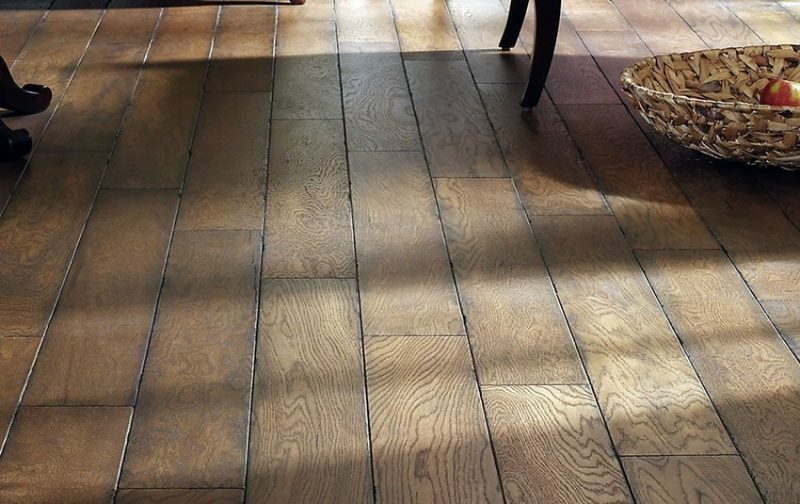 Most superficial wood scratches can be fixed with a hardwood cleaner or a wax filler. Click here for popular products for wood scratch removal.